How do you know when your baby has outgrown his infant bathtub? a) When he is able to slosh almost ALL of the bathwater out onto the floor with just one set of kicks. b) When he starts using the side of the tub as a teething device. c) When he grabs on to the side of the tub for dear life as you’re trying to pull him out. Yes friends, the answer is “d”, all of the above. He’s not quite big enough to sit up by himself in the big tub yet, so Daddy has to climb in there with him. At this point, we were getting soaked anyway, so why not? And in case you thought I’d be silly enough to post naked pictures of both of these boys, I’m not. Daddy is wearing swim trunks, and Max is strategically covered. We’re not too surprised that Max LOVES the bath. Especially now that he can kick around and relax a little. Except he keeps trying to drink the water…. This way, washing his hair is a breeze…. Of course, now that he’s so big, we had to buy him a real big boy towel. 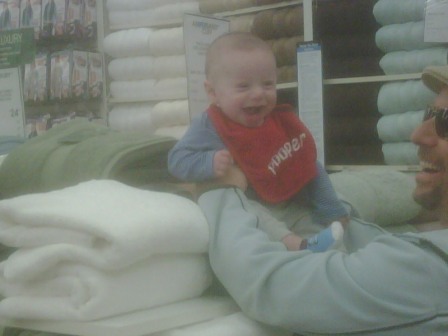 So we went to Bed Bath and Beyond and Max tried a few out…. Ah, the adventures of a growing (and now VERY clean) little boy! You just need to get a bigger sink…like one of those industrial size ones next to the washer.